Isn’t it strange that, in the middle of January, August can feel like just a few weeks ago? How can it be four months already since I arrived at Kabwata Baptist Church from the Lusaka airport? The cool Lusaka winter was already transitioning to the hot dry season. My jet-lagged body and brain were temporarily energized by the opportunity to meet the 2017 pastoral interns at Kabwata. (Kabwata’s pastoral internship program is partially supported by the generosity of HeartCry donors.) 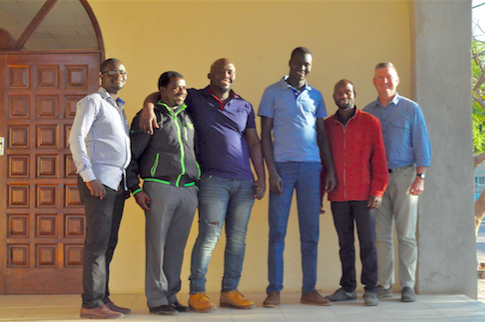 For a year, these interns interact with KBC's elders, integrate into the life and ministries of the church, and visit KBC'S mission stations where they gain real-life experience helping the mission pastor for several weeks. I am always excited to meet the interns, hearing both their background stories and the lessons they have learned thus far in their internship. Each time, I find myself wondering what God has planned for their futures. 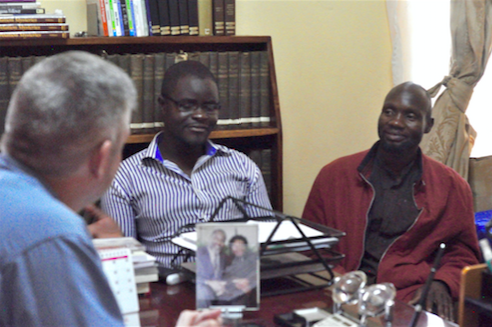 As I sat in Pastor Conrad Mbewe’s office talking with the interns, I never imagined that one of them would be gone four months later. I certainly could not imagine that he would be murdered, since violent crime was very rare during my years in Zambia. But Andrew Mulendema’s (in the red jacket) life was taken on December 29, and he entered into the joyous rest of his Master. Andrew was trying to help a friend sell a minivan. Through another business contact, they found a buyer in southern Zambia. Andrew and his contact took the van to meet the interested party. The ‘buyer’ lured them into the bush, shot and killed both men, and stole the van. At this time, I do not know if the murderer has been caught. Andrew leaves behind a wife, who is pregnant, and three sons. He was a member of Chilanga Baptist Church and completed the pastoral internship at KBC with a desire to serve the Lord in ministry. Please pray for his family and church as they grieve their loss. Of course, Andrew’s death is a reminder to us all of life’s brevity, and the need to serve our Lord while we have live and breath and strength. As Brother Paul recently pointed out in a staff meeting, Andrew’s murder also reminds us that we are in a real spiritual war. Yes, our God is sovereign, but we have a real enemy who seeks to destroy soldiers of the King by any means available. Let us be alert, stand firm, and pray without ceasing for the spread of the Gospel. Finally, let us love and serve and pray for our indigenous missionaries while we have opportunity.